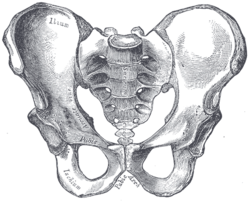 In humans, the sacrum is a large, triangular bone. It is at the bottom of the spine and the upper and back part of the pelvis. It fits like a wedge between the two hip bones. Its upper part connects with the last lumbar vertebra, and bottom part with the coccyx (tailbone). During the first half of life these bones gradually fuse together.